Bike sharing here in China uses a tiny fraction of the infrastructure required in America. The overhead and equipment are both simpler and smaller than programs in American and European cities. They use cheap bikes, and count on responsible behavior by their patrons. 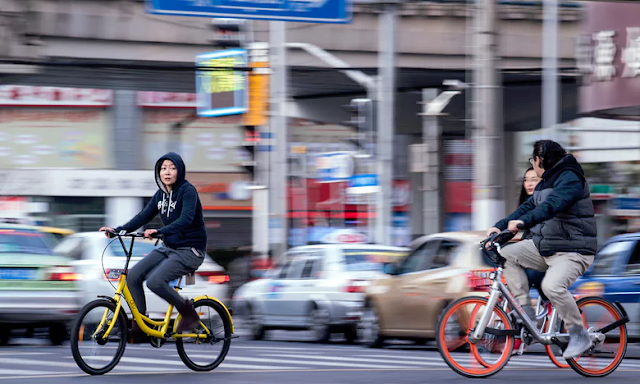 The cost of living in China may be 1/3 or 1/4 of what it is in the States, but bike shares in China are more like 1/50th of what they cost in America. The bottom line is that these bright yellow bikes are everywhere, and anyone can pick one up for 15c per hour. And anyone does. The reason bike sharing is so cheap and convenient is that lots of people use it, and the reason lots of people use it is that it's so cheap and convenient. My home town of Philadelphia inaugurated its Indego bike share program two years ago, and recently expanded to 1,500 bikes for a few downtown neighborhoods. Beijing has 200,000 bikes spread all over everywhere. American Bikeshare programs count on subsidies from the city and sometimes from environmental foundations as well. Beijing's several competing programs all run at a profit. Savor the irony: "Communism" has come to mean that the state leaves the most profitable franchises for startup entrepreneurs. Meanwhile, "capitalism" has come to mean that the state collects tax money from a million working people and channels it to Deserving and Efficient Multinational Corporations. Philadelphia's bikeshare is run by Independence Blue Cross. New York's is run by Citibank. Washington's Capital Bikeshare is subsidized by both local and Federal money, which goes to Alta Bike, a division of MotiviateCo. Every American bikeshare program uses bikes that are overbuilt, foolproof, and practically indestructible. I'm guessing the cost is over $1,000 per bike in quantity, though I've been unable to find cost figures. China's bikeshare bikes are sturdy but very simple, one speed, and I'm told they cost less than $50 each. China pays $50 for a bike. America pays $1,000+ for a bike + insurance against breaking + security against theft. Chinese bikeshares are slow and clunky, but not noticeably slower than their American counterpart. It doesn't seem to matter so much in China, where the custom is to ride more slowly. The set of American cycle enthusiasts contains a core of Velosport athletes; but in China, cyclists are students and workers and shopkeepers and businessmen, all of whom seem to saunter along at ~7 mph. Every rental bike has a wheel lock and a QR code in the tag on the back. Scan the code in your phone, and get a combination to unlock the bike. Ride where you want to go. Lock the bike on the street. Scan the code again to log out. 1 Chinese yuan is deducted from your account, about 15c. Once you know the code, what's to stop you from keeping the bike as your own? The main deterrent to theft in this system is, who wants a bright yellow bike with one speed and no resale possibility, with the constant possibility that your license number will be spotted on the street and you'll serve jail time? But my guess is that good will also plays a role, and that it just isn't worth stealing something and calling it "mine" when you can have one any time you need it for 15 cents. Perhaps the bikeshare entrepreneurs were smart enough to factor in a high theft rate on startup, but once the greed of a few thieves was satisfied, they were overwhelmed by hundreds of thousands of bikes on the street. If there's such a thing as a "Chinese national character," then part of it is being practical and short-sighted, doing things in the easiest and cheapest way. I've seen the down side of this short-sighted culture in the form of haphazard construction and consumer goods that fall apart. But as a model for a bike share system, there's a good case to be made for the "quick and dirty" approach. China is developing at a dizzying pace that no one can keep track of, let alone plan. There has been a huge migration of half a billion people from rice paddies to the cities. America has 5 cities with over 1 million people; China has more than 150. Currently, the most common vehicle on the streets of China is the electric bicycle, which can be purchased for a few hundred dollars. But there's much more diversity in vehicles, with lots of little electric vehicles, lots of small electric trucks, taxis and Ubers as well as motorcycles and cars. I'm predicting that the next wave will be self-driving electric cars. They don't add to the city's choking pollution problem, and you don't have to own them (or park them!) --you will be able to call one like an Uber, except that the car that appears will drive itself. A huge breakthrough will come when the fleet of self-driving cars comes to dominate traffic flow, and they are able to talk to each other on the internet and spread out to avoid creating traffic jams. This vision may come to pass first in China, where private car ownership is both less affordable and less entrenched than the West, and where central planning is not disdained by ideology.